If you tried to count all the online casinos in existence today, you'd probably give up without even going through a third of them. The number of places where you can gamble online is truly astonishing, but that's not to say there are no significant differences between them. Finding the best casino room for you can be a tricky business because every single online site, much like the live casinos, will flash you with shiny games and big promises. You need to be able to see beyond all that and pay attention to what really matters. This article about how to compare online casinos aims to help you do exactly that. I will list the top five things you need to look into before making your choice and trust anyone with your hard-earned cash. After all, you are fully entitled to get the best service for your money; you just need to know where to look. 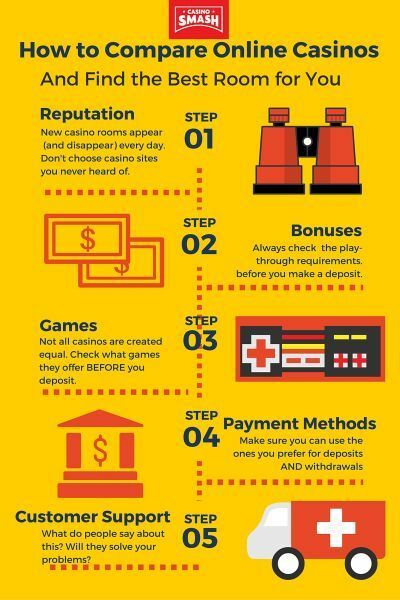 If a particular online casino attracts your attention with a sweet offer or special game type, the very first things you need to consider are their reputation and trustworthiness. Things may seem great at first, with huge bonuses and vast game selection, but all of this will not matter if you end up fighting an endless fight to get your money out. I've had several bad experiences with rogue online casinos that were able to lure me in with their promises of huge 500% bonuses or similar. Everything is fine until you happen to win, but then everything goes down the hill and trying to withdraw your money becomes a vicious circle of back and forth emails until they just stop responding altogether. You should stick to the names that have a good, longstanding reputation in the industry, like Bet365 Casino or William Hill Vegas. As long as you are not doing anything shady, you can expect to have no problems whatsoever getting your money in a timely manner. If you do want to give a lesser known online casino a shot, then make sure to check our list of legit new online casinos and see what other people are saying. If there is a number of complaints against them, you should probably steer clear. 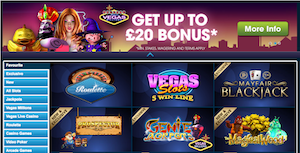 If there is one thing that online casinos are proud of, that's their bonus offering. In this regard, live casinos don't come even close to their online counterparts, as their reward systems pale in comparison. From the normal 100% to head-spinning 1,000% bonuses, you can find all sorts of offers floating out there. However, you need to be aware that things usually sound better than they really are and that bonuses are a part of – sometimes a bit too aggressive - marketing strategies. You will usually find these 1,000%+ bonuses offered on smaller casinos because they try to compete with big rivals and they need a way to attract new customers. 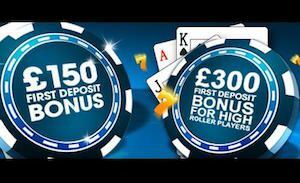 The problem with these bonuses is that they often have huge play-through requirements and very often only let you keep a small portion of your winnings. Depositing $200 to receive $2,000 is not that appealing if you have to play for dozens of hours and only get to keep $200 regardless of how much you win – right? Bigger casinos will usually offer more reasonable bonuses, say up to 200%, but they will also couple them with more sensible play-through requirements and there will be no cap on your winnings. Once you clear the play-through, you get to keep and withdraw whatever is in your account. Read also: Deposit Bonus Vs. No Deposit Bonus: What's Best For You? 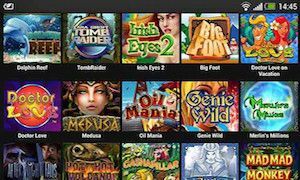 You are probably used to certain games being offered at your local casino and you might expect them to find them online as well. However, online rooms differ greatly in terms of games they have available and if there are particular slots or table games you enjoy, you need to make sure they are available at your target casino before making a deposit. I can say from a personal experience that it can be quite frustrating depositing your money on an online casino only to find out that they don't have any of your favorite slot games. 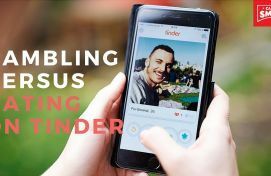 I am sure that some people love exploring and discovering new games and if you are one of them, then you don't have to worry about this aspect as much. Just don't go in thinking that every online casino offers all the games. They don't. Likewise, some big name casinos have started to offer live casino games and this can be a lot of fun. If this is what you are looking for, you will have to go with bigger casinos, though, as smaller rooms don't have the resources required to make this happen. One of the most important things for an enjoyable online casino experience is being able to move your money around quickly and efficiently. 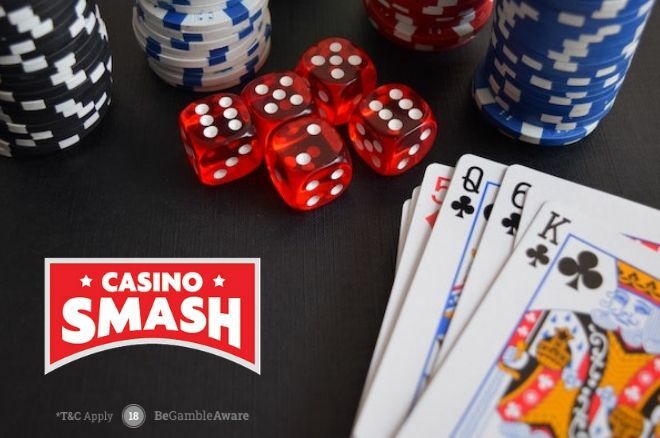 Before you make your pick, make sure the casino you are going with have your preferred method(s) available for both, deposits and withdrawals. 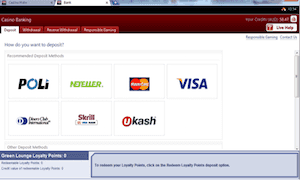 One thing you need to know is that not all the casinos offer the same deposit and withdrawal methods. This means that you may be able to deposit using your debit card but in some cases, you won't be able to withdraw back to that same card. The reasons for these restrictions go beyond the scope of this article, but this is definitely something you will want to pay attention to before committing any money. Although this may not seem like a big deal, sometimes weird things can happen even when playing at the biggest casinos. Your money gets stuck somewhere between your cashier and the last game you've played or you need to confirm your identity but there is an issue. A decent customer support will save you a lot of grief and make you feel your business is appreciated. Having to deal with incompetent support agents can be frustrating beyond words. Hopefully, these tips can help you find just the right pick for your online casino fun. The most important thing is not to rush into anything and always take big promises with a grain of salt. If something is too good to be true, there is probably a reason for it. As long as you stick to the online rooms with a good reputation and make sure they have the games you enjoy, everything should be in perfect order. You will be able to relax and have fun and you will be treated like you deserve as a paying customer. WOW! A Player Just Won $1,486,443 at 888!